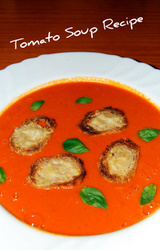 Here's a Tomato Soup Recipe that's quick easy and really good for you. With a little bit of practice you'll be making this delicious starter in around ten minutes. 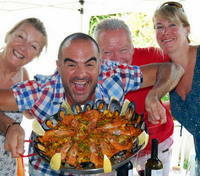 It's authentic Mediterranean food with all the flavours you would expect - fresh herbs, onions tomatoes, basil and garlic. 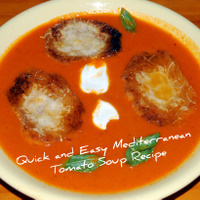 It can be topped with our crispy parmesan croutons and is great for vegetarians. Why not include it in your own Mediterranean diet. It's healthy and full of goodness. Eat well - feel full and satisfied and lose those excess pounds without undue effort. 2 x 16oz./450g. Cans of chopped Italian plum tomatoes, or if you want you can use the equivalent weight of fresh tomatoes after they have been skinned and roughly chopped. The same amount of vegetable stock (I measure it with the empty cans - or use a cube. 1 tsp. of tomato purée. 1 medium onion roughly chopped. 2 cloves of garlic - bashed. 1 tsp. of dried basil. A handful of fresh basil leaves. A 4 oz. tub of Greek yogurt (optional) if you want a creamier soup. 12 very thin slices of stale bagette - we use our own wholemeal bread. OK - first fry off the onion in a little olive oil. making sure not ot brown it. Then add the garlic - reduce the heat and cook for a couple of minutes. Right add the tomato, dried basil, sugar and stock and bring back to the boil. Meanwhile - sprinkle a little olive oil on your bread, top with the grated parmesan and grill until golden brown. Let the soup boil gently for a couple of minutes and then whiz it with your hand stick blender. Ladel into warm bowls - top with the croutons and sprinkle on a few fresh basil leaves. Delicious and so easy!